A bill which will allow homes to be searched without a warrant was passed with overwhelming support by the United States Congress. The bill was signed into law by President Trump with no media coverage. Only five Congressmen from the House of Representatives voted against it: Representatives Justin Amash, a Republican from Michigan; Walter Jones, a Republican from North Carolina; Thomas Massie, a Republican from Kentucky; Alex Mooney, a Republican from West Virginia; and Mark Sanford, a Republican from South Carolina. 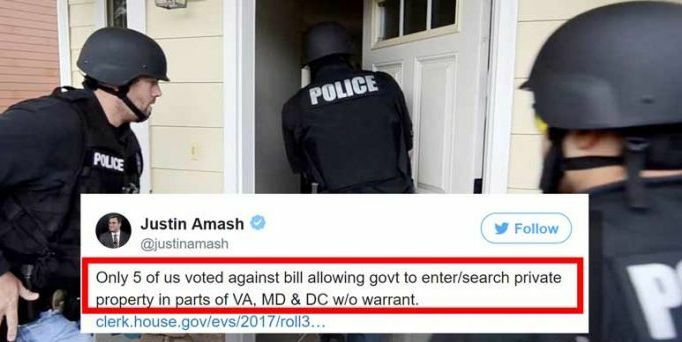 “Only 5 of us voted against bill allowing govt to enter/search private property in parts of VA, MD & DC w/o warrant,” He wrote on Twitter. While it may only affect the Washington D.C. metro area for the time being, the overwhelming support for this bill in Congress, coupled with the fact its passing was completely ignored by the media, means this sort of legislation may be a blueprint for future legislation countrywide.